Now that it's clear Christo and Dora will not be able to nest on the Christodora this season, the question is, what will they decide to do? I found them both in Tompkins Square today in the big tree near Avenue A & 7th Street. Christo is on the lower left, Dora on the right. 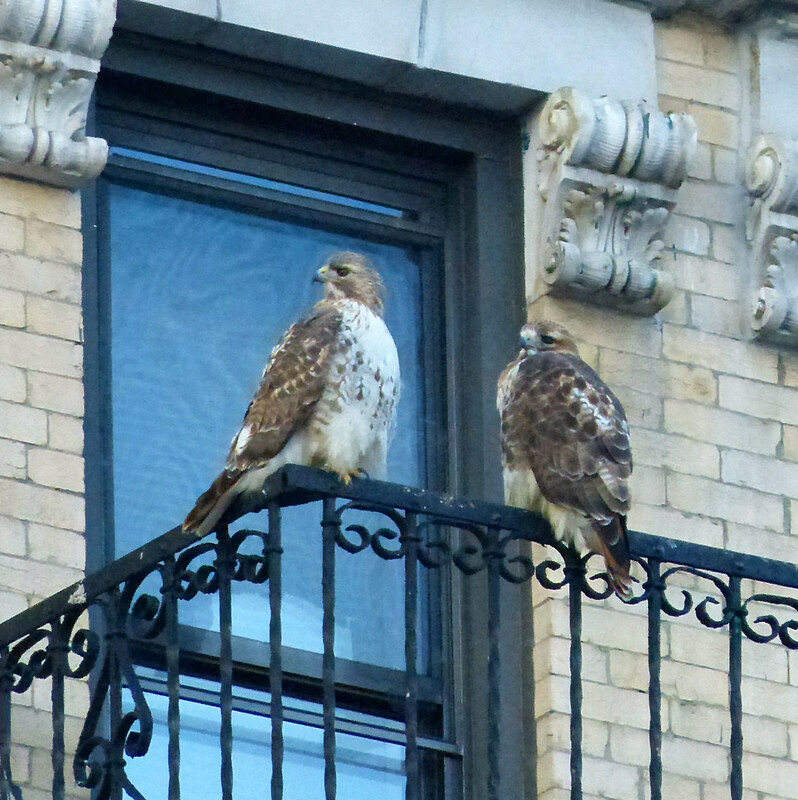 They shared a pigeon for lunch, then disappeared SW, towards 1st Avenue and 6th Street. I've seen them flying that way pretty often, but they always return to the park. Christo soon returned and caught and ate another pigeon in the park. Then he seemed to be actively hunting again along Avenue A, but he flew off again towards 6th Street. 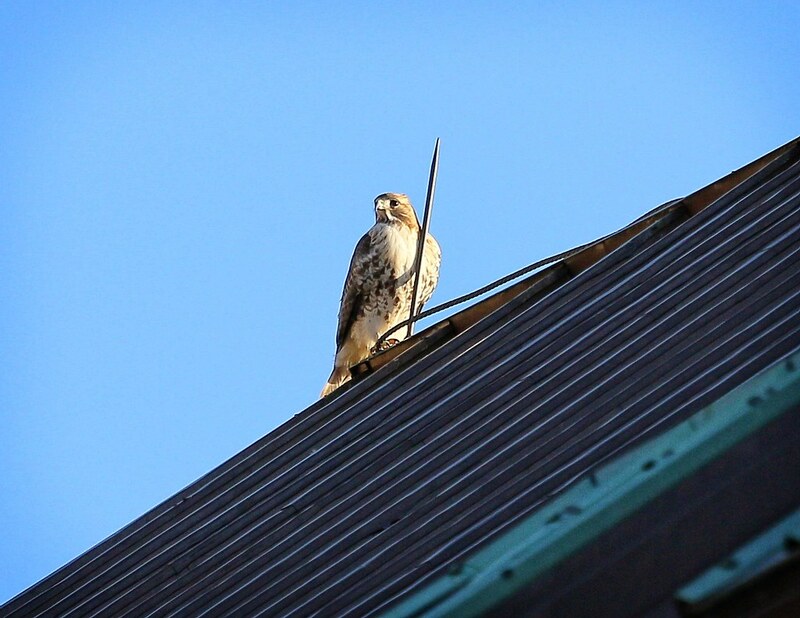 A short time later, he reappeared and perched atop St Brigid's church on Ave B & 8th Street. From there, he made an awkward lunge towards a window across the street and I wasn't sure if he was going after something or scouting out a possible nest location. Both hawks circled around the Christodora for a while and Christo performed some nice kiting right over the top. He hung there for almost a minute. 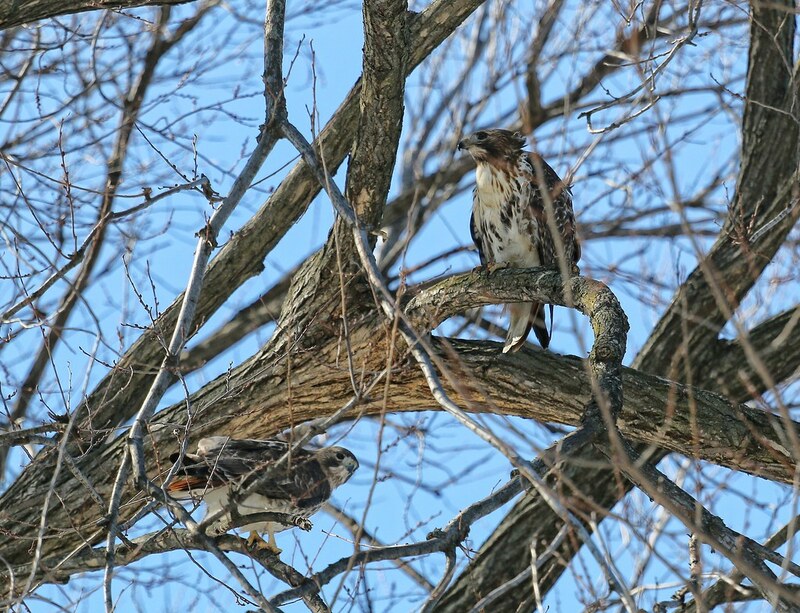 Both hawks kept flying high over the park and I lost them when they flew NE towards Ave C & 11th Street. As it was so brutally cold out (10 degrees and windy), I couldn't keep up. 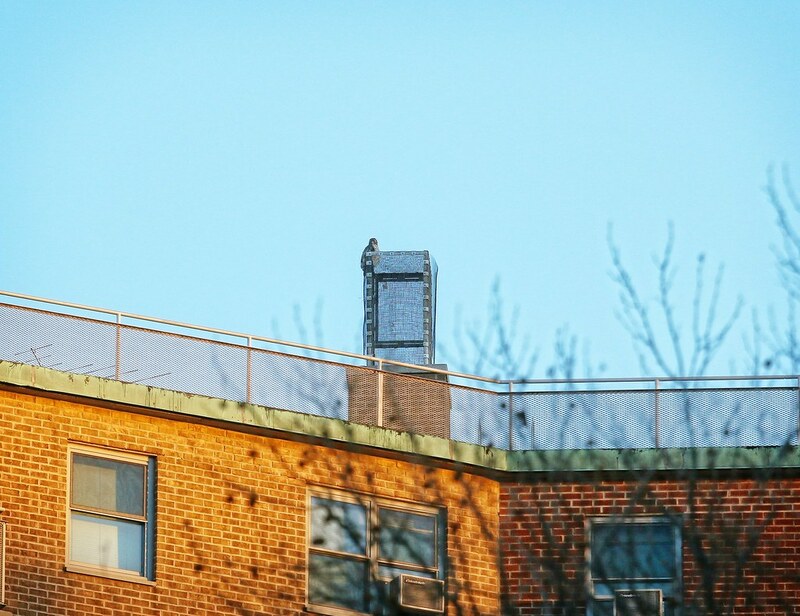 Then, on my way home, I spotted a hawk sitting atop a chimney on the Village View apartments on 6th Street between Avenue A & 1st. It was too far away for me to be able to identify it. Eventually, it flew east over Avenue A and I lost it. I did not see any stick-gathering today, nor did I see any attempts at mating. I take this to mean the hawks' nesting plan has been thwarted, so they're taking a break until a new site is found. If anyone sees them flying with sticks or nesting material, please let me know. 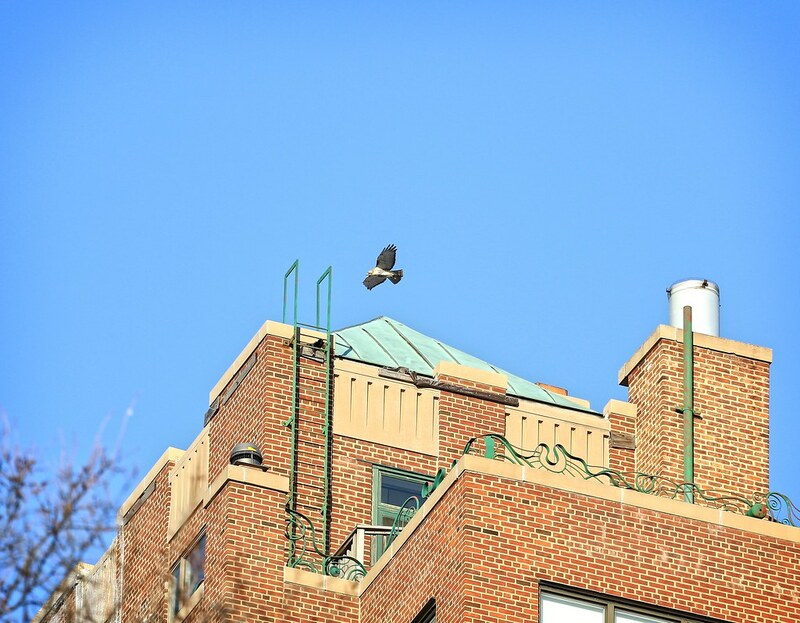 Meanwhile, it looks like hawk love is in the air over at Washington Square Park. Here are our two lovebirds a year ago on Valentine's Day. Christo is on the left, Dora on the right.